eeBoo Studio » Blog Archive » Time Out Chicago Kids: eeBoo Silver Robot Pencils a Holiday Favorite! Time Out Chicago Kids: eeBoo Silver Robot Pencils a Holiday Favorite! Time Out Chicago Kids just released its Holiday 2011 Gift Guide and selected eeBoo’s popular Robot 24 Spectrum Color Pencils as part of their ‘Kids 8 and Up’ category! One of only 20 products chosen, Time Out called our pencils “nifty”! 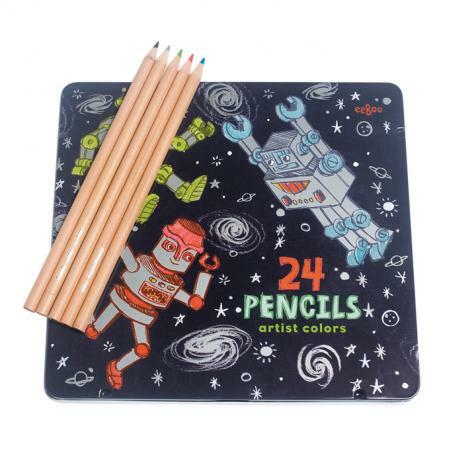 eeBoo’s Silver Robot Pencils make a great stocking stuffer, and pair perfectly with our similarly popular Silver Robot Sketchbook and Silver Robot Metallic Pencils!